bottom of the case for a customized look. Price includes 1 free nameplate. change from standard square cases. Interior dimensions are 9 1/2 x 9 1/2 x 9 1/2. Also available for a soccer ball or volley ball. 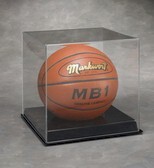 Our tabletop basketball acrylic display case is beautifully designed and constructed. pictured is not included). Display case is shipped fully assembled. 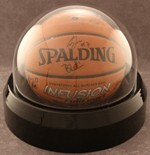 Our wall mountable basketball acrylic display case is beautifully designed and constructed. pictured is not included). Display case is shipped fully assembled and wall mounting hardware is included. From Ball Qube Basketball / Soccer Ball acrylic display case with built in ball stands. It's durable construction is the best protection of your collection. Interior dimensions are 9-1/2 x 9-1/2 x 9-1/2 Price includes 1 free nameplate. Additional nameplates are available. in ball stands. It's durable construction is the best protection of your collection. Inside dimensions 10-1/2 x 10-1/2 x 10-1/2. This case holds 1 regulation size NBA or NCAA football. Single basketball acrylic case. Similar to our other gold riser case, but without the gold risers. This case has a black acrylic base. It gives the case a more traditional look. Features optically clear, richly beveled UV protected acrylic, all handcrafted and polished to a high luster. This is not one of those cheap, mass produced display cases. This is a high quality investment in the protection of your memorabilia collection. Price includes 1 free nameplate. Additional nameplates are available. Desktop full size basketball acrylic case with black base and gold risers. Features optically clear, richly beveled UV protected acrylic, all handcrafted and polished to a high luster This is not one of those cheap, mass produced display cases. This is a high quality investment in the protection of your memorabilia collection. Full mirror back. Price includes 1 free nameplate. Wall mountable basketball acrylic case with black base and gold risers. This is similar to our desktop case, but with a wall mound bracket on the back. Features a full mirrored back. Also features optically clear, richly beveled UV protected acrylic, all handcrafted and polished to a high luster This is not one of those cheap, mass produced display cases. This is a high quality investment in the protection of your memorabilia collection. Price includes 1 free nameplate. luster. This is not one of those cheap, mass produced display cases. collection. Full mirror back. Price includes 1 free nameplate.